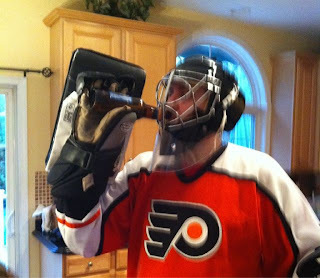 Zoo With Roy: Hail Mary: A Reverse Flyers Jinx Hockey Edition Bolg Post, Eh? Hail Mary: A Reverse Flyers Jinx Hockey Edition Bolg Post, Eh? Zoo With Roy corporate strategy consultant Johnny Scardino (who eats linguini for breakfast and brushes his teeth with mussel gravy) saw just how dynamic the results of my Raul Ibanez SAG-O-METER were, and so pitched to our editorial staff (after baking some ziti) the notion of applying the same approach to a certain, local NHL team that may or may not have shown up for their playoff series against the Bruins. The board was all, "ohai free content, yes please!" And so, here's Johnny (who actually spells it "Pasta Fazooool" when writing poetry for the ladies). Hey, whatever, you know? Sometimes you find yourself in strange places; like a darkened alley on 9th and Federal street with nothing but wet pants on, or an 0-34 slump at the plate. These things happen. Yet it's in those times when you grasp for any sign of hope that whatever mess you found yourself into, you can eventually get yourself out of it. Enter ZWR. Since his Raul Ibañez Sag-O-Meter post, the dude has gone on a complete baseball-hitting bender. Raul's 0-34 slump turned into 8-12 with 2 HR, 5 RBI, and 4 R. I got to thinking about what other local sports stars (or 'relatively noteworthy left fielders' in Raul's case) this Sag-O-Meter may perhaps benefit. I didn't have to think for long. With the Flyers mired in another 0-3 series deficit to the Boston Bruins without Simon Gagne to save the day, my mind went directly to one man: Mike Richards. I felt somewhat vindicated and somewhat offended (strictly because of the sheer volume of moronic statements Jeremy Roenick has made covering this postseason on Versus) that JR mentioned in his video breakdown segment how Mike Richards seems to be standing still all the time. But I guess when you're too busy getting drunk at McFadden's passing out your number on the back of an ATM receipt, little things like 'competing' or 'trying' tend to slip by the wayside. 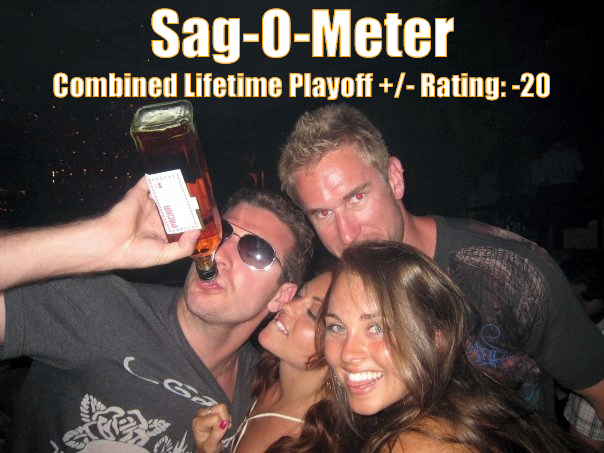 So I created the Mike Richards Sag-O-Meter... but in doing so, it didn't seem right to leave out his best friend and cohort Jeff Carter. Honestly, they are a package deal though, aren't they? Should of said, "STAG-O-Meter," amirite? !